When was the last time you went on a safari? Please don’t say your honeymoon. Too many people go to Africa—once—and detour to see the big five in between some time in the city and a few days on the beach. The schedule is frantic. The animals don’t appear where and when you plan to see them. While there’s no time to get to know the countries, let alone the people, you’re visiting. So this safari will be different. You’ll stick to not just one country (Rwanda), not just one national park (Volcanoes), but one lodge (Sabyinyo Silverback). You won’t search for lions and elephants and buffalo and leopards and rhinos. You’ll only be on the lookout for gorillas. Though you won’t be disappointed when you see monkeys, as well. Plus you’ll visit nearby villages, explore a famous research camp, and hike up volcanoes. You can tell this trip will be special as soon as you arrive at Sabyinyo Silverback Lodge. Although it’s in Musanze, the country’s most-visited district, and Kinigi, the town where the headquarters of Volcanoes National Park is located, the lodge feels very remote. 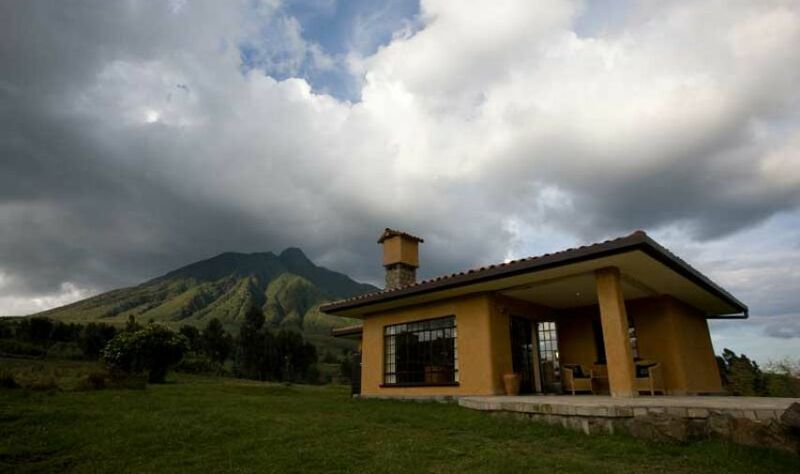 It sits on the foothills of Mount Sabyinyo, an extinct volcano in the Virunga Mountains. Clouds ring its peak right now, but take a look tomorrow to see why it’s nicknamed Old Man’s Teeth. The 17-acre property is dotted with stone cottages that have terra-cotta roofs. Hot towels, cold lemonade, and a roaring fire are waiting for you in the main lodge. As you sip the lemonade, your hosts explain the activities from which you can choose over the next few days. Mornings start early at the lodge; your villa’s assistant will arrive around 5:30 am with a wake-up call and coffee. After breakfast, you’ll head out for the day. You can watch a large group of Sykes’ monkeys leap between bamboo branches and frolic on the forest floor during a golden monkey trek. You can explore the abandoned Karisoke Research Center, where Dian Fossey studied the gorillas for 18 years. You can buy brightly colored woven baskets from a local village or watch the medicine man prepare herbal mixtures at the nearby Iby’Iwacu Cultural Village. Or you can hike to the deep crater lake at the top of Mount Bisoke, an active volcano that last erupted in 1957. You can do all of these activities after the one thing that brought you to Rwanda in the first place: the gorilla trek. Mountain gorillas are critically endangered. It’s estimated that less than 1,000 of them still live within three national parks in Central and East Africa. 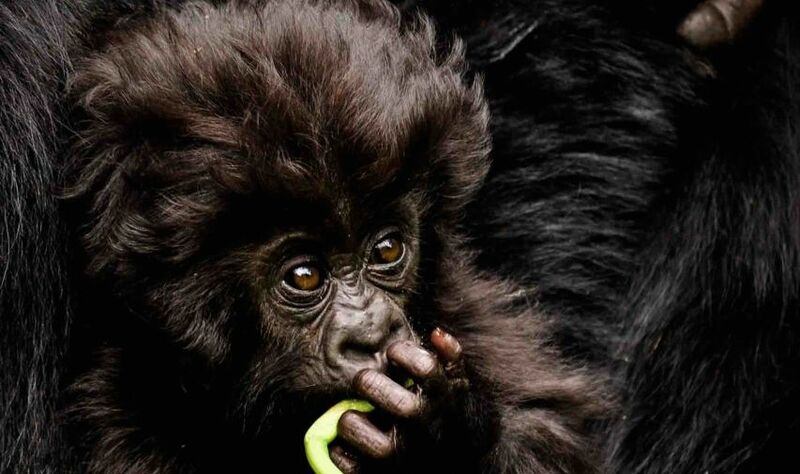 Ten gorilla families have been found in Volcanoes National Park. Each family is made up of at least one silverback, several females, and their offspring. A ranger will guide you through the cloud forest. Within a few hours, he’s usually able to track one of the families. Though everyone must maintain a safe distance, you’ll have one hour to watch the beautiful, human-like creatures in their natural habitat. Just try not to fall in love with the babies as they stare at you with their wide brown eyes. So go relax in your spacious cottage—there are gorgeous views from the bathtub and the terrace—before dinner. You’ll get to know the other guests and hear about their day’s exciting adventures from a long table in the dining room. Then it’s off to bed. You have an early wake-up call for your own Rwandan adventure to begin.